Friday evenings as a young child, sitting in front of a (real) fire at my grandparents' house watching Mork and Mindy and repeating "Na-nu na-nu" for days afterwards. Teenage 'dates' at the local cinema, waiting for that catchphrase - "Gooooooood Morrrrrning Vietnaaaaaaam". Sitting in the lounge of my first 'proper' flat after graduation, with the Aladdin soundtrack on repeat. Seeing my little sister laughing (over and over) at Mrs Doubtfire. A VHS copy of Dead Poets Society that never failed to leave me sobbing... until it eventually snapped from being played and rewound so many times. These are just a small number of many memories which are linked with Robin Williams. I knew nothing of the man's personal life and struggles, but when I paused to think about why I'd felt so upset at the news of his death, realised that his incredible work was always there in the background. From my childhood in the late 70s right up to the present day. 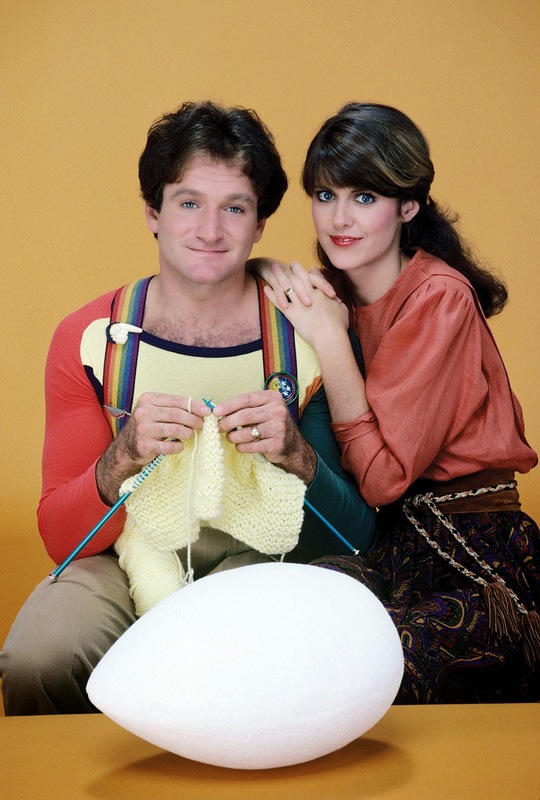 The family have been quoted as saying he'd want us to recall the good times, and not the way it all ended, so I'm sharing my favourite Robin Williams picture in which he appears (as Mork, which is how I mostly remember him) to be knitting. I wouldn't mind re-watching Mork and Mindy, as it happens. How about you? He was a very talented man with a BIG heart. The characters he created on TV and in movies will live on and will continue to make us laugh and cry. He occupied all my childhood with his comedy and my favourite all time film Good Will Hunting that I watched again only last Friday. It's terribly sad and I feel it as a loss to the culture of my past and the laughter that could be in my son's future. Re-runs at the ready. Behind the laughter there is so much sorrow. If someone famous dies we are reminded of the less known that suffer too. Thanks for your perspective . I agree he would want us to smile when we think of him. Hi was a big park of my tv/movie past as well. None of us is one thing, I will miss him.